Forum Index > Makers and Manufacturers Talk > English Cutler knives - reborn! Posted: Thu 06 Feb, 2014 12:49 pm Post subject: English Cutler knives - reborn! The knives are handmade as are the scabbards and made to reflect pieces of the time in terms of size, look and finish, but overall to be great value for money; I hope you like them. In designing each knife I have taken an example or a range of elements from roughly the same date and place and so have been able to give a date an references for it. However I have carefully chosen the pieces so that they are similar to items that were made on each side of this date. 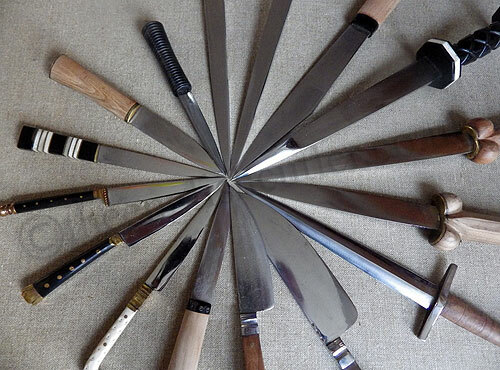 In this way each knife has been given 'true dates' and then 'plausible dates'. Plausible dates being ones where the knife is similar enough to knives to from these dates to be generally acceptable for reenactors. Posted: Thu 06 Feb, 2014 1:05 pm Post subject: Re: English Cutler knives - reborn! I love the new lineup. Very nice pieces for the price. I hope these sell well, though I'm pretty sure they'll be popular, especially if you plan to keep them in stock all the time. Oh wow, I really like some of those new pieces, which seem quite the bargain as they have the fitted sheath included. I will certainly check out the the rondel 1, although are you able to mix up the blades such as put on the fancy blade from the bollock 3 onto rondel 1? I was struck by the simplicity of the Mary Rose bollock dagger though - it looks so typical of the ones found. I like the fact these simple seeming knives have been found with suites of by-knives too - honest and practical. Very nice, hope they do well. Sorry if I misunderstood the pics or missed a note about this - for the units showing more than one color sheath, is the color your choice (ok I think) or a customer choice via email or...? Might consider a note on your site vs. customer confusion & procrastination. Many thanks guys for the kind words and of course feedback would also be very welcome. The intention was that they would be a bargain and indeed I think they are Lou (my wife) keeps saying as she wraps up another - too cheap, too cheap. Anyway part of the reason of being able to hit this price point is that there is no customisation as part of the build at all. I may (if spoken nicely too) change the chape for one of my fancier ones at cost price, but otherwise no. I am of course fully open to custom work. Thanks and thanks for highlighting this. Not sure what happened there, both I and my developer overlooked this rather obvious aspect. it will get rectified and in the meantime just drop me a mail letting me know. At this stage the numbers of these knives are limited. Oh l'm sorry you already own it. Thank goodness your taste is better than your jokes! "Oops! This link appears to be broken" in relation to "15thC Rondel Dagger 1"
Also the pictures in relation to the "15thC Bollock Dagger 3" are non-clickable unlike the other knives.